We all know the score when it comes to weddings: happiest day of your life, flowers, champagne, general rejoicing. Unless, that is, you happen to be at the opera. 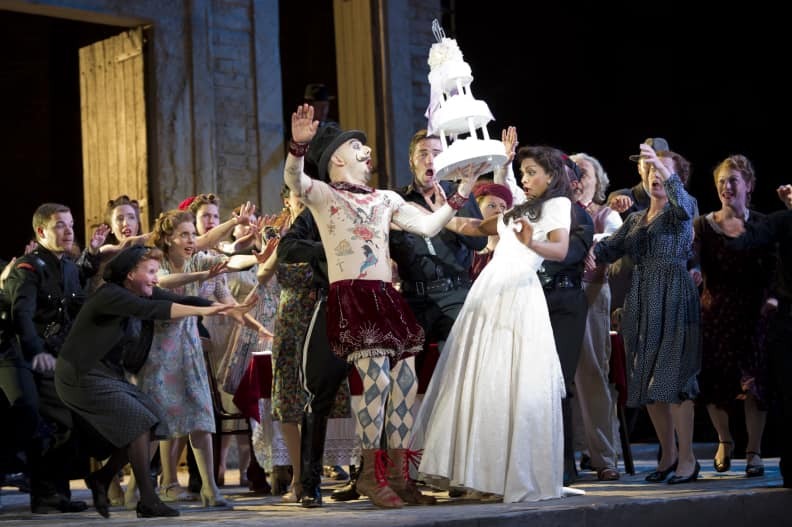 As likely to end in tears and tragedy or comic chaos as love and celebration, operatic weddings provide some of the genre’s most memorable scenes. Multiple marriages, exotic disguises and surprise reveals (as well as a bearded lady, and even the occasional murder) all play their part in transforming domestic bliss into high drama. So put on your smartest outfit and prepare to catch the bouquet at opera’s very best weddings – just don’t expect anyone to live happily ever after. Anything musicals can do, opera can do better. Why settle for Seven Brides for Seven Brothers, why you could have 50 brides and 50 brothers? Francesco Cavalli’s Hipermestra opens with perhaps the biggest wedding scene in all opera, when the many daughters of King Danao and the sons of Egitto all take their marriage vows in the work’s first five minutes. Sadly, however, their unions are over just as swiftly. King Danao (worried by a prophecy that predicts he will lose both his life and kingdom to one of his sons-in-law) orders his daughters to murder their new husbands. But when Hipermestra refuses it sets a tragic sequence of events in motion. Set in a modern-day Gulf State, Graham Vick’s production for Glyndebourne celebrates the opulence and excess of this spectacular mass-wedding, complete with giant wedding cake, and more veils than a nunnery. Madama Butterfly, Tour 2016. Photo: Clive Barda. For callow young naval captain Pinkerton, marriage to the geisha Cio-Cio San is a temporary inconvenience – a contract no more permanent than the lease on his house, and subject to similar monthly renewals. But while the couple’s Act I Japanese wedding is merely a bit of play-acting for Pinkerton, for the love-struck Butterfly herself it is a passionately serious affair. While Pinkerton’s melodies are all patriotic bluster and musical sound-bites, Butterfly’s delicately chromatic, East-meets-West music reveals the complexity and the depth of her feelings. We know, even as we watch the couple take their vows, that all cannot end happily. Don Pasquale, Festival 2013. Photo: Clive Barda. 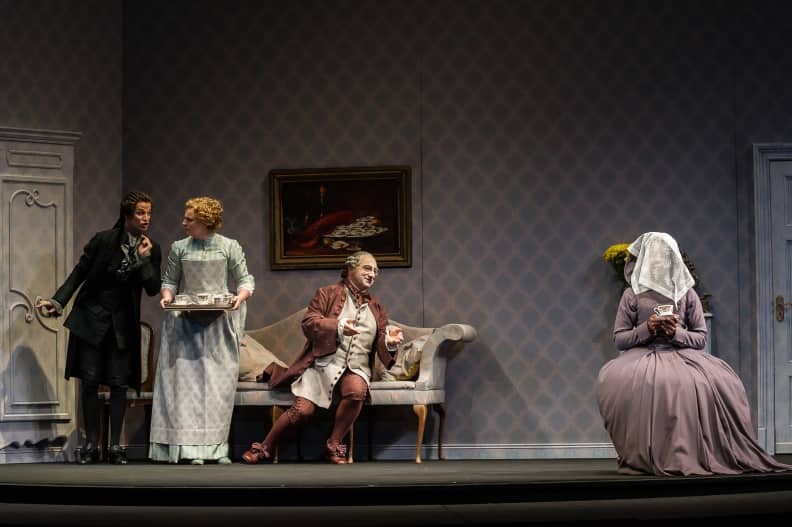 Marital deception may be a commonplace in opera, but few schemes can match those of Donizetti’s Don Pasquale for the sheer audacity and complexity of their intrigue. Hoping to disinherit Ernesto, Pasquale plans to marry. But his choice, the innocent ‘Sofronia’, is not all she seems. Having married Pasquale in an elaborate ceremony (fake, but Pasquale doesn’t know that), she proceeds to make his life hell, throwing off her meek persona and making endless demands. The sudden change of personality is deftly captured in music that drives the energy of this madcap caper along. Pasquale splutters in increasingly agitated and chattering semiquavers while ‘Sofronia’ and her accomplices interject. The whole finale has the feeling of a runaway train – hurtling inexorably towards a comic precipice. When it comes to fairytale weddings it doesn’t get much more magical than Massenet’s Cendrillon, which is based on Cinderella. In a diversion from the plot-according-to-Disney, Massenet’s young lovers both wander out into the forest at night after the ball. Each is lost, but guided by La Fée (the fairy godmother) they arrive in an enchanted glade of flowers under a magic oak tree. Here they sing of their love in a mystical marriage ceremony, before falling asleep in one another’s arms. There may not be a church or a vicar, but this is one of opera’s most beautiful marriages – a meeting of hearts as binding as any formal ceremony. Massenet’s opera has different musical styles for different characters, but even at first hearing you’d be able to identify the fairy music. Glinting metallic-bright with high woodwind, and shimmering with strings, it radiates magic, bathing the mystical union of Cendrillon and her Prince in an other-worldly musical glow. Sir Walter Scott’s historical novel The Bride of Lammermoor lends its gloriously gothic plot to Donizetti’s most celebrated tragedy. As the title suggests, a plot of family vendettas, ghosts and revenge all hinges on a wedding. Tricked by her scheming brother into believing that her lover Edgardo is unfaithful, Lucia agrees to marry his ally Arturo instead. But as soon as she signs the contract, alarms go off in the orchestral strings, anticipating the bloodshed ahead. Edgardo appears and, in an arresting sextet that is the emotional heart of the opera, confronts Lucia with her betrayal. The image of a woman in a bloodstained wedding dress might be a staple of horror movies, but Lucia di Lammermoor got there first. All the conflict set in motion in Act II’s finale starts to free-fall through the opera’s final act, leading to suicide, murder and madness. As wedding days go, this is dark, even by opera’s standards. Mistaken identities are a regular feature of operatic weddings (it’s always a good idea to check to see who’s actually under the veil), and the confusion is rarely an innocent mistake. One of the funniest substitutions takes place at the end of Verdi’s late, great Shakespearean comedy Falstaff. The beautiful young Nanetta is in love with Fenton, but her father Ford is determined that she will marry the wealthy Dr Caius. The two men hatch a plot to perform the marriage ceremony during a masquerade, knowing that Nanetta will be dressed as the Queen of the Fairies. Caius and the Queen are duly joined, but once the ceremony is complete it is revealed that Caius has married Bardolph – one of Falstaff’s followers – instead, while Nanetta has secretly married Fenton. But, this being a comedy, everyone has to laugh at the situation, and the opera ends in a riotous final ensemble (‘Tutto nel mondo e burla’) declaring that the whole world is a joke. Our Festival 2009 production of Falstaff is available on DVD. The Rake’s Progress, Festival 2010. Photo: Alastair Muir. Stravinsky’s Hogarth-inspired opera The Rake’s Progress is a cautionary tale of what happens when an young man succumbs to the temptations of the big city. Goaded by his devilish mentor Nick Shadow, Tom Rakewell swaps his innocent love Anne for a rash marriage with Baba the Turk – famous circus performer and bearded lady. While the wedding itself takes place offstage, we do get a brilliant musical snapshot of an unhappy marriage. Baba might have a beard, but she is in all other respects the stereotypical chattering wife, barely drawing breath in her giddy ‘As I was saying, both brothers wore moustaches’, a relentless monologue with which she assaults a monosyllabic Tom at the breakfast table. Newly-wedded bliss this is not, but in Stravinsky’s skilful hands it is a brilliant piece of domestic musical drama. 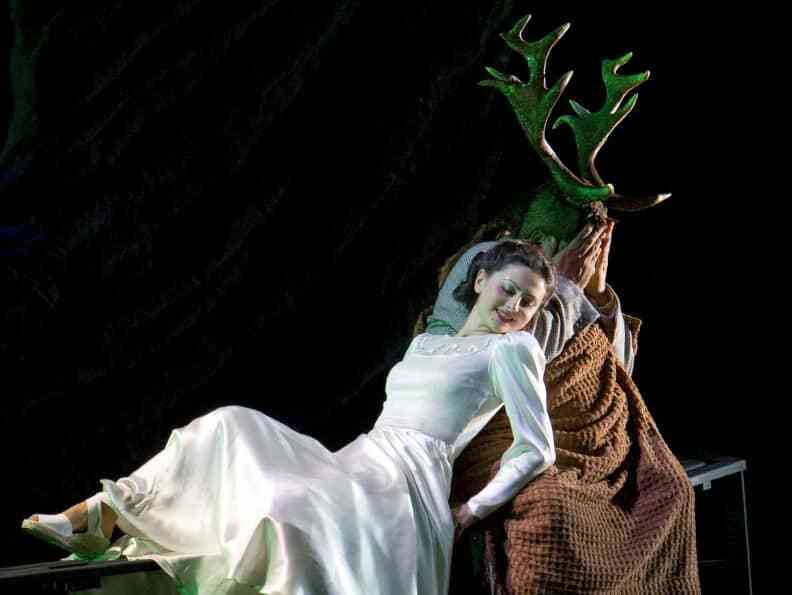 Our 2010 production of The Rake’s Progress (designed by David Hockney) is available on DVD. What’s the worst thing that could happen on your wedding day? What about your bride running off with another man? That’s what very nearly happens to peasant Masetto at his wedding to the flirtatious Zerlina. Spotted by the serial seducer Don Giovanni, who makes a beeline for the pretty young bride, he invites the whole wedding party to his house for a celebration as an elaborate ruse to get Zerlina on her own. Masetto might be angry with her, but it would take a woman made of stern stuff indeed to resist the seductive power of one of Mozart’s most gently inviting melodies. ‘La ci darem la mano’ (There I will give you my hand) sings the Don, the picture of musical innocence, and Zerlina melts, joining him in this glorious duet. Our 2010 production of Don Giovanni is available on DVD. 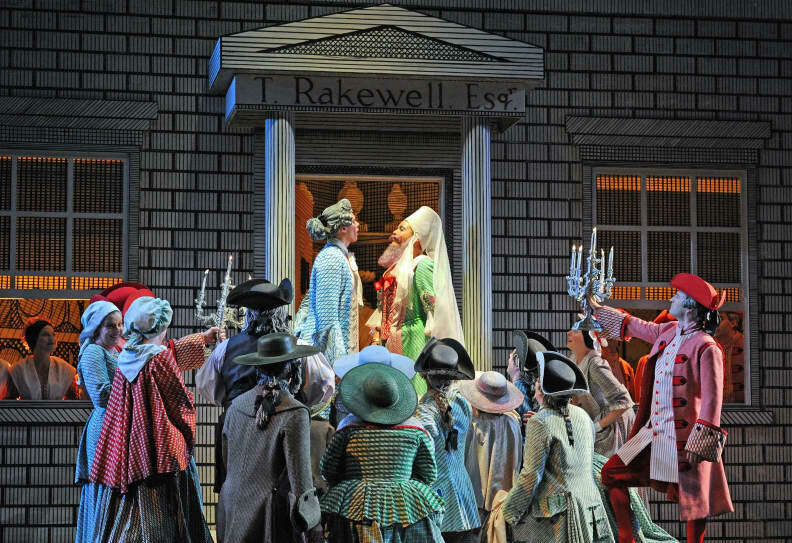 Like all good romantic comedies, Rossini’s Il barbiere di Siviglia (The Barber of Seville) ends with a wedding, but it’s far from your normal church-and-flowers affair. Barred from seeing his beloved Rosina by her guardian Don Bartolo (who secretly wants to marry her himself), Count Almaviva climbs into her home with a little help from his wily sidekick Figaro. 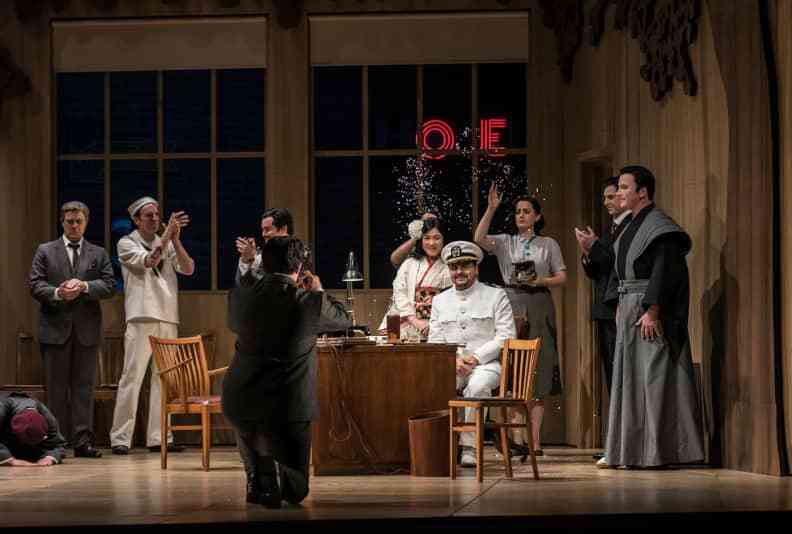 Surprised by Rosina’s music teacher Don Basilio and a notary, come to marry Rosina to Bartolo, Count Almaviva orders them to help him marry Rosina himself, which (with sufficient threats) they both do. Love is triumphant, and the lecherous old Bartolo must be content with Rosina’s dowry. The quick-fire comic denouement is set in motion by a vivacious trio for Rosina, Figaro and the Count. “Ah, qual colpo inaspettato” takes them from surprise reveal to a proposal of marriage and finally to a swift-footed near-escape from Basilio and the notary, breezing along on a guitar-like accompaniment from the strings, punctuated by cheeky woodwind interjections. Never has the dramatic weight of a wedding been worn more lightly. Our 2016 production of Il barbiere di Siviglia is available on DVD. L’elisir d’amore, Festival 2011. Photo: Bill Cooper. It wouldn’t be a proper wedding celebration without some good music, and Adina and dashing soldier Belcore’s almost-wedding in Donizetti’s L’elisir d’amore includes one of the composer’s catchiest duets. The villagers are gathered for the wedding party, and Adina and the travelling quack Dr Dulcamara kick off proceedings with the playful duet ‘lo son ricco e tu sei bella’ (I am rich and your are lovely), whose broad comedy cuts cruelly against the rising desperation of shy Nemorino, who is secretly in love with Adina. But, although she feigns indifference to Nemorino, Adina shares his feelings, and contrives to get the marriage itself postponed, but not before the ladies of the chorus have said their piece in a charming number ‘Saria possible’. This wedding scene may lack an actual wedding, but more than makes up for it with the charm and energy of its musical drama.